So I was working on a tutorial for luvinthemommyhood’s Baby Bonanza this weekend (it’ll be up on Wednesday, sorry to tease), and I needed to make straps. I hate making straps (as in ties on a hat or drawstrings or purse handles, etc). It’s always something like “fold the fabric in half and then tuck the ends under and sew it shut” in which case you see the stitching, or “sew it inside out and then try and figure a way to turn it right-side out”, something that always leaves me sticking pencils and other sharp objects through my fabric and screaming. I can’t tell you the number of times I’ve sewn a ribbon inside the strap and then had it pull through the seam as soon as I started pulling. Not this time. This was so easy it blew me out of the water. I don’t know why I never done it this way before, and I’m certain I can’t be the first person to discover this, but honestly I’m feeling pretty brilliant right now so if you’ve done this your entire life just keep your yap shut. OK, kidding. sortof. Step 1: Cut your strap fabric. The finished strap I needed here was 3/4,” so I cut it 2″ wide. Your finished width will be =[Starting Width – 1/2″ / 2]. Two straps are shown here because I was making a pair. You only need one piece of fabric for each strap. Step 2: Fold strap in half lengthwise to find the center. 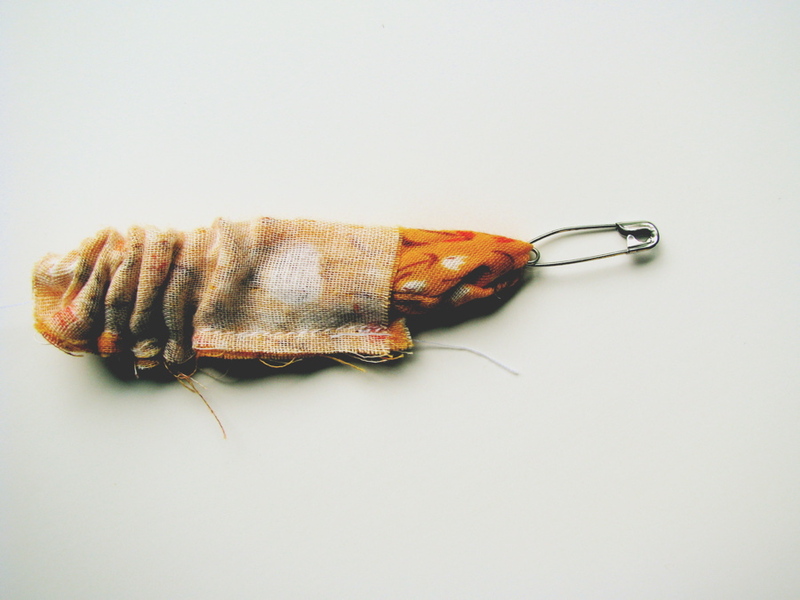 Place a safety pin along the fold near one end, with the head of the safety pin facing the other end. Note: the width of the safety pin needs to be pretty small compared with the strap width since you’ll sew it inside the strap in the next step; for very narrow straps you will need a very small safety pin. 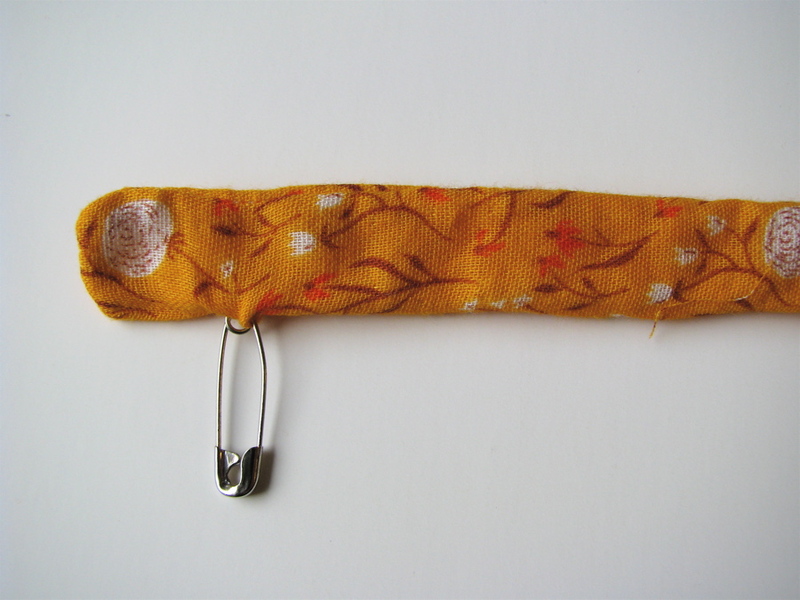 Step 3: Fold the strap in half lengthwise so the pin is covered by the fabric. Line up edges. 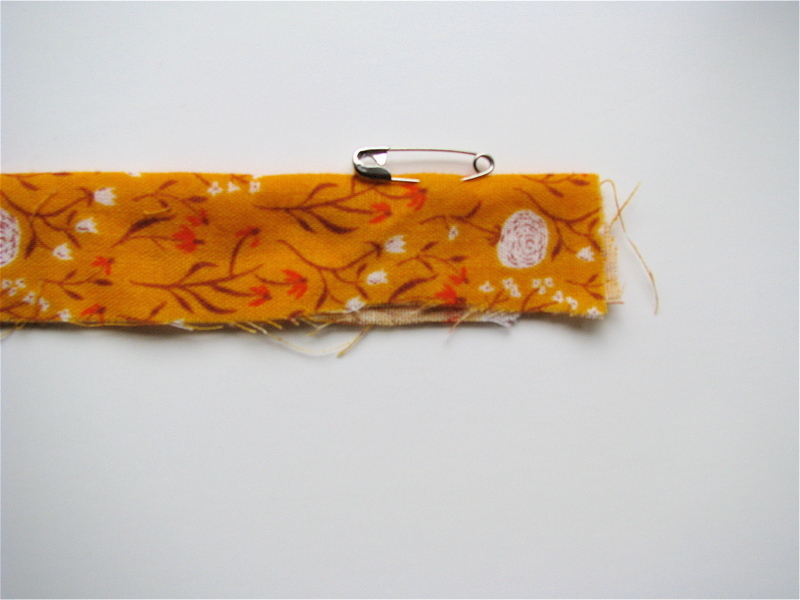 If you want a finished end, sew across the end of the strap nearest the pin with a 1/4″ seam. 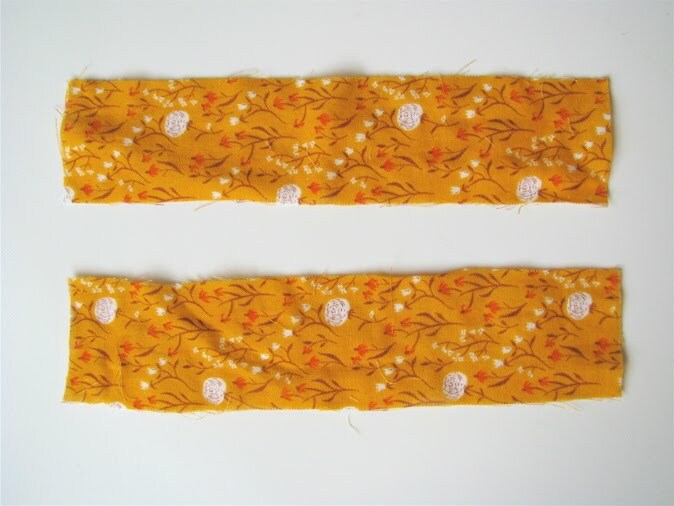 Turn needle at corner and continue sewing the entire length of the strap with 1/4″ seam, leaving the other end of the strap open. Clip corners at finished end. Step 4: Push pin towards open end to turn the strap right side out. You can stick a tweezers or other sharp object into the strap to help push the corners out if you want. Step 5: Remove pin and press strap flat. If you want the other end of the strap finished, tuck those raw edges under and press. That's a new one in my book! Definitely brilliant… give yourself a pat on the back!! It really used to make me cry too! Until I found some Dritz Quick Turn tube turners at Joann's. I sound like an infomercial, but it was life altering for me! i can't tell you how many projects i skip because of annoying straps! Oh wow! What a simple and brilliant idea! Thanks for sharing this – I know I'll need to try this at some point. I wish I could pretend that I've been doing it like this all along!! BRILLIANT! I never would have thought of that in a million years… genius! I hate making straps too… I think that's why I sew with ribbon so much… you don't have to make strap that way..
Aha! That's pretty good! Funny, b/c I'm working on my tutorial for luvinthemommyhood right now too! Harder work than I thought!! new to me! Love it! Thanks for sharing! ooooo. brilliant to sew the end shut! LOVE it! totally doing that from now on. I usually use a tube turner, but for those really long tubes, what a great solution. Way to go Rae! Thanks for sharing. I have the fast turn tubes that I have permanently borrowed from my mother (she will never get them back because they are so amazing). However, this sounds like a great trick when I can find all the parts. Thanks for sharing again. My favorite trick is to sew about halfway down the strap (inside out of course), leave a gap, then sew up the bottom portion. You can then turn the strap by pulling it through that middle opening rather than trying to stuff the entire thing through the tube. You then topstitch it to close the gap. This method has substantially reduced my swearing. OH MY GOODNESS!!! Brilliance in the shape of a safety pin! This will defintiely become a go-to trick for all the little girly dress straps I've been doing AND I'll quit teaching my son new ways to cuss out fabric! LOVE IT! YOu need a loop turner it's the best invention in the world. You'll wonder why you didn't have one before (I sure did) it takes some practice to get the hang of it but they are awesome and way faster than safety pins even this super clever way you've discovered. I love this idea! Thanks!! I will do this forever more :o) I hate getting my strap stuck half way turned and not being able to get a good grip on anything! This will fix everything!!! Ha! Gotta try that. There is nothing I hate more than turning straps. I *was* making some headbands for my shop, but ultimately decided to scrap them simply because I hated turning them so much. I have to try this! sweet! Definitely gonna try that one! I have a loop turner and still end up swearing every time I need to turn a strap. Thanks for the tip! Nice! I will definitely try that next time. Thanks for the tip! My mom showed me how to turn with a safety pen, but with leaving both sides open. I’ve never thought about sewing the pen in first! Of course I always pull too hard and tear the fabric . . .
you deserve a medal! seriously. A big shiny gold medal. Brilliant! I might start making things with straps again! As others have said…brilliant. I've been threading elastic that way my whole life. I would have never thought to use the technique with straps/fabric ribbons. Wow! I think its a great idea! I always use a long needle to do this, I will try your idea next time! Like most strokes of genius, simple and brilliant. Seriously, that is fantastic! Thanks for sharing your new method. I keep a box of new pencils on hand and I have found that pushing the eraser end into the end seam of the inside out strap and bunching the strap down the pencil makes turning very easy too. When it is right side out, the pencil easily slides out. Brilliant!!! I will definitely be trying this. I too have ruined a few straps by ripping/poking through the fabric. Nothing like teaching you kids how to swear. Those words just sometimes slip out and you can never take them back after they hear you! This is life changing! Thank you. I love this tip! I finally heard of a thing called a loop turner and haven't looked back since! It's such a great little notion and comes in handy when your straps aren't too long as well. Can't wait for the tute tomorrow! I CAN'T believe I never thought of that! I absolutely HATE making straps and other skinny, tubey things. Thanks! After reading your post, I remembered reading another tip somewhere that I'd thought at the time was really good. I finally got around to searching it out tonight. You can see it here. It's particularly helpful for spaghetti straps or button loops, but would work for any other kind of strap, too. my god, you are a genius. i've struggled with turning narrow straps inside out so. many. times. 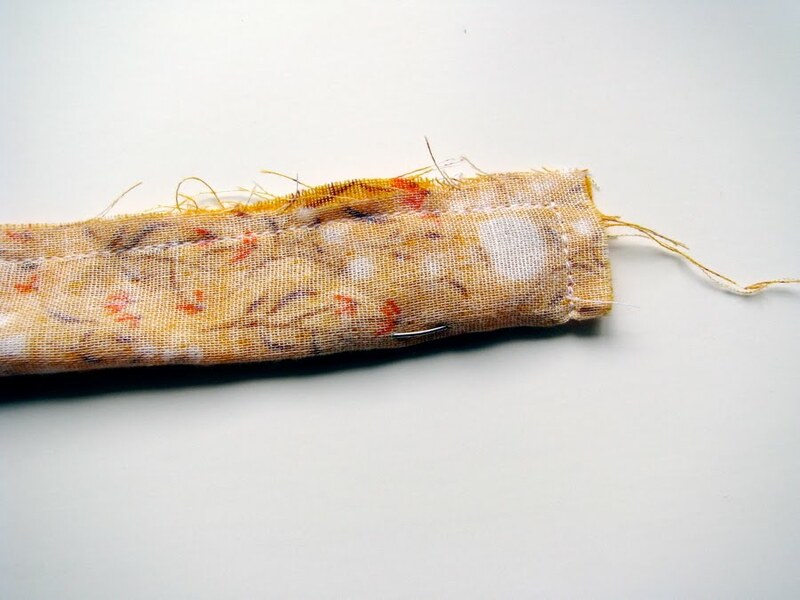 depending on how wide the strap is you could use a larger safety pin too— even a cloth diaper one that has the safety close so it won't open and poke out when turning. ouch. 🙂 great idea! love it and it totally works too. Nope.. you really ARE brilliant.. im making a crib bumper, and have 56 ties to make ! i almost teared up when i found your instructions ! if i hadnt, i would have been doing ties till the day this baby was born ! THANK YOU ! THANK YOU ! THANK YOU ! This method works well for soft fabrics. But I use the heavy decoration IKEA fabric, and I use a long bambou to turn my bag handles inside out after having ironed the first sewing. Thank you! Thank you! I was at my wit’s end! You’re a genius! Thank you. I just knew there had to be an easy way to turn a sash!!! I was getting so annoyed about this the other day, and have just stumbled upon your freaking genius tutorial. So so so so so so so good. Will this method work for a long drawstring (more than 1m)? I tried doing it but have not been successful. Can’t seem to get the pin out to the other side 🙁 Any tips? I can’t thank you enough!!! I have been frustrated the past 40 years as I have struggled with turning straps! You are an angel…and a brilliant one at that! OUTSTANDING!!!!!!!!!!!! Thanks so much for this tip. I knew there had to be a better way that folding over, and over, and over–then ironing. I had about 20 straps to make, this was SO much easier! Very nice, well done and looks awesome! I will try it, soon!